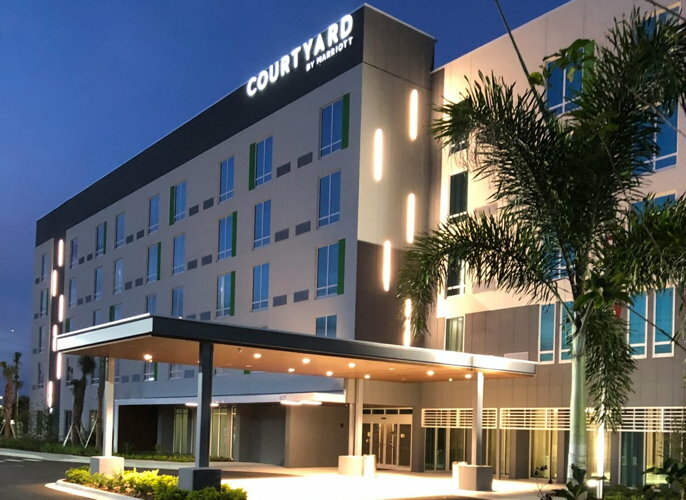 Located at 6225 Cypress Gardens Boulevard, the 111-room hotel will operate as a Marriott franchise, owned and managed by Murphco of Florida, Inc.
Courtyard by Marriott Winter Haven is scheduled to open its doors in Winter Haven, Florida on Tuesday, January 15, 2019. Featuring an innovative lobby space as well as Courtyard's latest contemporary room design, the new hotel provides flexibility and choices that allow guests to optimize and elevate their travel experience. Signature furniture and architectural elements replace traditional art in the new guestroom. The "LoungeAround" sofa offers a pop of color and a comfortable area for relaxing or for working. The new design also features a light desk on wheels, allowing guests to work from anywhere in the room. Each room also features HDTV's offering premium channels and streaming capabilities of Netflix, Hulu, YouTube, and HBO GO. Some rooms offer spectacular views of Lake Dexter. The Courtyard Winter Haven features the brand's latest lobby design, where guests can enjoy an open and modern environment outside of their rooms. The newly designed Bistro is the epicenter of the lobby, which fosters social connections and collaboration with more flexible and informal seating options. The Bistro offers guests a wide variety of "made to order" breakfast and dinner items, "grab and go" options, and also features an array of cocktails, beer and wine for guests to unwind at the end of the day. Coffee lovers can also enjoy freshly brewed Starbucks coffee.